The orchid humidity tray is one of the best tools that I use for the care of orchids. Here is the only humidity tray that I use for growing orchids indoors. These trays just make orchid growing simplier, easier and less stressful for you and your orchid plants. These are Humidi-Grow Trays. 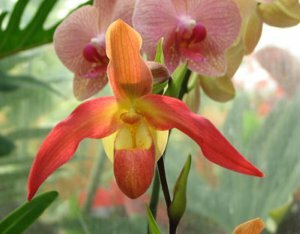 They are a fabulous tool for how to care for orchids and creating a more humid environment for your orchids. I grow my orchids mostly indoors in Northern California and have over 20 of these trays in various sizes and shapes. They are one of my "favorite" orchid growing tools. And very suited to growing orchids for beginners. Humidi-Grow Tray allows you to use posts with large drain holes without worrying about excess water pouring out and causing structural or furniture damage. The overflow will pass through the pot and collect in the tray where the settled water will evaporate and help offset the loss of transpiration of moisture through the leaves. You can have your orchids on various pieces of furniture and wood and do not have to mess with saucers, or pebbles or worry about getting a “ring” from the pot on a favorite wood table or dresser. This orchid humidity tray is designed for ease of use and minimal care. Just empty the old water when the tray gets dirty, wash the tray and grid with mild soap and water, and then refill with water. Your indoor plants will remain fresh and healthy. No stones to remove, no algae to scrub off and no dirt to change. I love my orchid humidity trays. You will love them. Your orchids will love them! The picture above shows what the Humidi-Trays are like and how they are used. As I said I currently use these and have for many years. They are wonderful. Because they are such a great tool I also sell these trays to my visitors and subscribers. Below is a list of sizes and prices and a convenient Paypal shopping cart. I do not always have all the trays in stock. I do order wholesale and must often by quite a bit at one time. If I am out of stock of the product, it will take a little longer to get your order to you. So I ask for your patience as my supplier will not dropship to my customers. If this is the case I will contact you and let you know the shipment will be delayed. Please note if you are interested in these humidity trays and are not in the United States please contact me directly and do not use the PayPal shopping cart. It is not set up to calculate international postage. I am happy to ship internationally but contact me directly for total shipping charges to your location. If you have any further questions about these humidity trays do not hesitate to contact me. My supplier has raised the prices on these trays. I will be raising the prices on this site as of July 1, 2015. So if you want the trays at the old, less expensive prices you should order by that time. In addition, I am traveling for a few days and will not be able to fulfill any orders until after June 23, 2015. Also, I should probably note that the supplier now has black trays as well as brown. I do not always stock these in black as it is a lot of inventory to carry but I can get them. If you prefer black just let me know and be prepared to wait for me to order them from the supplier. 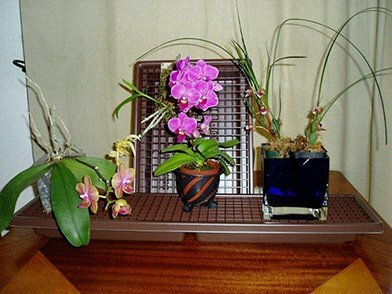 *Orchid Humidity Tray HT 104 and HT 105 as the 3 pack come with a free 2 tier stand.